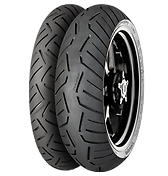 Revolutionary new-to-the-market technologies to realize Continental‘s new level of grip, safety and dynamics in the radial sport-touring segment. TractionSkin, the revolutionary micro-roughness of the tread optimizes the mechanical adhesion and realizes the safest, fastest running-in time in the market. MultiGrip Technology improves mileage by wear resistant central tread area and safety in curves by higher grip in shoulder area. Dynamic-Ride-Technology improves handling and control of your bike by using patented steel cord construction and a unique contour.